Tayrona National Park is an amazing park in Colombia and one of the most well-known places in the whole country. It lies on the Carribean Coast, only one hour drive from Santa Marta. And why to visit Tayrona? There are many reasons why to travel here, but what about diverse flora and fauna, sandy beaches, rough waves, tall coconut palms and sun all day long? Before our trip to Tayrona National Park, we were a little bit reserved and did not want to look forward to it too much. Honestly, after we spent last year in cold Calgary, we needed a few days by the beach that much, that we were worried that one of the well-known destinations in Colombia would disappoint us. Fortunately, it didn't happen by no means. Our concerns were mainly about too many people in the park and overpriced food and accommodation. Initially, we even wanted to change plans, because our arrival date was on Thursday and we wanted to avoid crowds during the weekend. Thankfully this concern regarding the overfull park wasn't proved right, and we were glad we did not overthink it. At this point, we must forego, that we visited Tayrona at the end of July while the busiest season is from December to the end of January, but taking into account how hot destination Tayrona National Park right now is, we couldn't be sure. The other concern was related to prices in the park, and although we spent more for meals and accommodation than usual, it wasn't insanely overpriced. 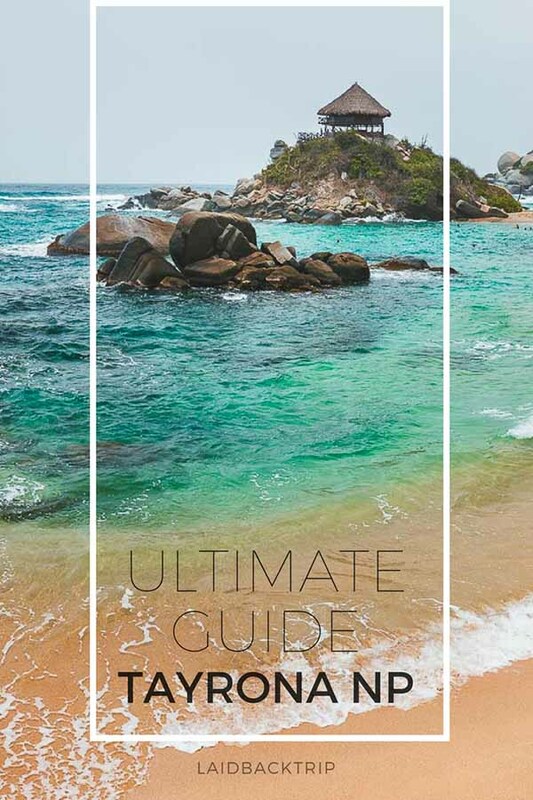 Although Tayrona National Park belongs on the list of the most-visited places in Colombia, it is not easy to find a comprehensive guide with up-to-date information. That's why we come up with the Ultimate Guide to Tayrona National Park to make your travels easier. The nearest big city and the best access point to the park is South America's oldest surviving city, Santa Marta. It is not a city where we would like to spend more time than necessary, and a city beach is more a crappy place than something that should ignite your wanderlust and prepare you for the beauty of Tayrona National Park. However, the city is primarily a place where to spend a night before going to Tayrona as every solid hostel or hotel should store your luggage during your visit of the park in case you have more than you want to carry with you. The bus from Santa Marta to El Zaino, the most common entering point, leaves frequently (every 20 to 30 minutes), there are several stops where to jump on the bus, but we found the most convenient place at Public Market at Calle 11 & Carrera 9, the bus leaves when full. It takes about an hour to get from Santa Marta to El Zaino (the worst part is to get out from the city) and the ticket cost COP 7 000. From El Zaino (where you'll buy a permit to enter the park) you can either walk 4 km on a paved road to get to Castilletes (the first beach) or take a shuttle for COP 3 000. We recommend the latter as there is nothing impressive along the path and you'll save some time for exploring the park. Our Travel Tip: It can get incredibly hot in Santa Marta. Our hotel was only 2 km from the bus stop, so we decided to take a walk to save some money, and we regretted the decision immediately because from this point we didn't stop sweating for next three days. Once you get off the bus in El Zaino, you must buy a permit to enter the park. The fee is COP 54 500 for foreigners and COP 16 000 for Colombian citizens. It is not cheap, but you can stay in the park as long as you wish. After paying, you'll get a wristband as a proof of payment which you must have on for the whole length of your stay. Don't forget ID as it is necessary for registration. There is a limit how many visitors can enter the park every day, so if you plan to arrive in the high season, you should book your permit in advance on the park's website, and it will help you to avoid the queue offseason. At the moment, it is recommended to have a vaccination against yellow fever, not compulsory. Because the park's environment is fragile, and the number of visitors grows rapidly it's been decided that from 2017 the park will close its gate every year from late January to the end of February. The reason for the closure was the attempt to purify mother nature, and the decision has been made by Colombia's largest indigenous community. Although the loss of revenue must have been significant, the results on flora and fauna were incredibly positive after the first year. Check before your visit if the park is open and if not, don't despair. There is so much to see and do in Colombia, and we believe every tourist place needs some time to gain back its sustainability. These actions should always remind us that we cannot take the beauty of nature for granted. You can sleep in many hotels near the park's borders, but it means you would have to pay every day the entrance fee or you can stay inside the park, where it is easy to find various options of accommodation. There are a few upscale cabins such as Ecohabs in Cañaveral area, but the most of visitors stay in campgrounds, where it is possible to sleep in a tent (yours or rented) or in hammocks. Campgrounds are scattered along the coast, and all of them are relatively close to beaches. Areas, where you can spend a night, are Castilletes, Cañaveral, Arrecifes and the most famous one, Cabo San Juan del Guia. We stayed at Arrecifes in Camping Don Pedro, and although it was a little bit further from the beach, we liked the position, because no one apart from guests did walk through, so we felt that our belongings are safe(r). We rented a tent for COP 72 000 per night including breakfast (when you'll come with own tent, it should cost only around COP 30 000). We felt it was a bit pricey because usually in Colombia we paid even less for a room, but it was still ok when we consider the unique surroundings. To make sure there is a space available, we contacted Camping Don Pedro via Facebook, and they replied very quickly (there's wifi in the campground for a small daily fee). The only issue we had was the way of payment. They wanted us to make prepayment via bank transfer, but we refused to do so (first of all, we were not sure how safe it can be; secondly, in case we couldn't come it would have been hard to get a refund; and last but not least we don't speak Spanish (although we are getting better every day) and it is hard for us to communicate about everyday things and the idea of visiting the bank and sending money just sounded like time-consuming matter with an uncertain outcome. Luckily, they made an exception for us (maybe because I was very annoying and insistent), without making the prepayment. Amenities in the campground were simple but clean. Toilets, cold showers (it was 35°C during the day and almost 30°C at night, so trust us, you don't want to have a hot shower here), safety boxes where you can keep your valuable belongings (bring your padlock or you can borrow one here), food storage and restaurant. The tent itself was ok, but there were several holes in the mosquito net, so we were glad we brought our own. And one more thing, and it doesn't apply just for the camp, but for the whole park. No kidding, but watch out for falling coconuts. We've never seen and heard that many coconuts fall from palms that close to us. Everything is a bit more expensive in Tayrona National Park, but it is nothing which should keep you away. The most overpriced is water, one liter cost around COP 5 000, which is five times more than in the cities. We brought with us one 5 liter barrel, but because of the heat, it lasted just a day. Beer cost COP 4 500 and fresh juice COP 5 000 (if you want to get real natural juice, ask for a version without sugar - sin azucar). We had breakfast included in the rate, but it usually cost around COP 8 000 (eggs, arepas, coffee), lunch and dinner cost from COP 15 000 to COP 32 000 per meal in restaurants near the beach or at the campground restaurant as well. Do not expect miracles, just regular fried Colombian food or some pasta. Tayrona National Park lies on the Carribean Coast, so it is obvious to find out that the motivation for why to arrive are beautiful beaches, relaxation, and a laidback vibe. The only thing is, because of treacherous offshore currents and strong waves, not every beach is suitable for swimming. Watch for red flags to make sure it is safe. The supposedly best beach is called Cabo San Juan. The deep bay with a strip of sand is the most crowded one, but no wonder when it is one of few where it is possible to swim. The Mirador provides beautiful views of beaches, the sea, and jungle behind. This is also a place where most of the one day visitors will have their lunch and break. Another reason why this beach gets such an attention and attracts travelers is the option of sleeping in the hut on the top of the rock in hammocks. We really liked Punta Las Gaviotas and it quickly became our favorite place where to go for swim and hang - the beach where you can safely dip in the sea. And the best part? It was almost empty in the morning. Another bay safe for swimming and snorkeling is La Piscina, a smaller beach between Punta Las Gaviotas and Cabo San Juan. The very photogenic beach is Arrecifes (not suitable for swimming). The east end can be dangerous because there is a lagoon where caimans can be present. It is also the only beach where we've seen the guard watching for the visitor's safety all day. The famous and easily accessible trek is the one starting just behind Cabo San Juan Campground. The path leads from the sea through the jungle to a place named Pueblito. The trip takes an hour and a half one way, and it requires some strength and determination. The path is a bit challenging, first of all, because of the heat (take plenty of water - in Pueblito there is a small stall where you can buy something to drink) and secondly, it is an uphill climb over stones all the way up (don't wear flip-flops). The whole path walks through a tropical-forest which is full of mysterious (sometimes creepy) sounds and unexpected movements. Pueblito is an archeological site, where you can enjoy the tranquil atmosphere of the ruins. The jungle already swallowed the most of the more than 500-years old village, so you might not be impressed by the site size however, it is an important place both historically and spiritually. Please be respectful of the residents and don’t take their photo. Overall, the trail is easy to follow. There are signs on every 10% of the trek's distance. There is only one part, where it is hard to navigate, and we actually met two people, who got lost, and followed the wrong path for about 45 minutes before they realized it is incorrect, and they must've headed back (hadn't we met them, I believe, we would've done the same mistake). This place is right before you reach Pueblito, on the 90% mark. It seems that you should go left, but you must take the path on your right which is a bit hidden behind the rock. Another easy to follow hike takes only about an hour and is right at the beginning of the Tayrona National Park at Castilletes (it goes from the place where vans stop). The hike is called 9 Piedras (9 Stones). It is mostly a jungle trail (loop) with some stunning ocean views. You can see stones (with unusual holes in the upper part) after which the path has been named along the trail (not sure there were 9 of them though) which were used by indigenous people to observe the passage of the cosmos. Keep your eyes open to spot animals or exotic plants and flowers. There is a lot to see, the success depends on your luck, patience, and quality of your eyesight. There is not much to do in Tayrona National Park if you're looking for diving, boat tours or snorkeling. There is only one snorkeling spot on La Piscina Beach. You must hire a guide who goes to the water with you, and because of strong currents, we're not sure about the underwater world diversity. Also scuba diving is an option for more adventurous souls. You can hire a horse to commute quicker between campgrounds and beaches. Is it possible to visit Tayrona National Park in one day? Yes, it is, although it won't be a relaxed experience. If you're short of time, and there is no other option, go for it. In one day, you can get a quick sample of everything the park has to offer. But if time allows, we strongly recommend staying at least overnight and enjoy the mixture of seaside destination and the jungle remoteness. We stayed for three nights and it felt just right. We had time to walk from beach to beach, do some hikes in the jungle and even had one day to do mostly nothing (just got sunburnt). In a nutshell, the park is safe, only watch your belongings as usual and do not wander in the forest after dark. We recommend to take mosquito net and strong repellent with you, but we were surprised there were fewer mosquitos then we've expected (in July).